On P3X-116, SG-1 comes under attack by death gliders and an al'kesh piloted by Tanith. 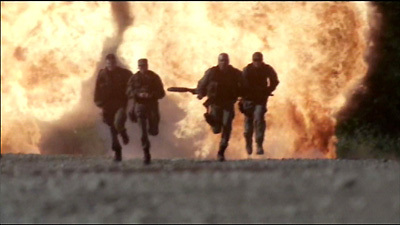 Teal'c shoots down the ship before following his teammates through the gate, but the explosion prematurely disengages the wormhole, leaving Teal'c behind. Attempts to re-dial the gate are met with gate protocol errors, and Carter's analysis determines that Teal'c's energy signature is still trapped within the gate itself. A permanent iris prevents further use of the gate, while Daniel and Major Davis travel to Russia to liaison with the Russian stargate program, and Carter works to find a solution that will rescue Teal'c from the gate. Colonel Simmons arrives at the SGC with Dr. McKay, an arrogant scientist considered by the Pentagon to be the world's foremost expert on the gate, and he brings word that the Pentagon has imposed a 48-hour deadline to find a solution. A DHD may provide the only answer, but the Russians have the only working DHD, and they are unwilling to cooperate without a significant offer in return. As both negotiations with the Russians and cooperation between Carter and McKay reach a stalemate, Simmons makes his move. He blackmails Hammond by offering the information to save Teal'c in exchange for a Goa'uld hand device. O'Neill turns once again to Maybourne, hoping to find the source of Simmons' information. Together they locate the NID safe house where Adrian Conrad, now a Goa'uld, is being held in secret, and they are able to obtain not only the information to save Teal'c, but also evidence incriminating Simmons. As the 48-hour deadline is reached, the Russians agree to a temporary loan of their DHD, and Carter is able to use the device and the information from Conrad to resume the stargate's reintegration process. A power surge destroys the Russian DHD, however, Teal'c is safely restored, with no awareness of his ordeal. An event horizon dematerializes an object, turning it into matter and transmitting it through a subspace wormhole. The receiving gate translates the energy signature and reconverts it back into its original form of matter. The stargate has massive amounts of memory like a computer buffer that temporarily stores energy signatures before reconverting them in order to make sure the information is complete before reintegration. One of the gate痴 safety protocols erases the energy imprints from the control crystals each time the unstable vortex of a forming wormhole is established, like an overall system reset. The stargate is capable of emitting up to 400 feedback signals and safety protocols during a dialing sequence. Using the dialing computer rather than the DHD can ignore as many as 220 of them. Destruction of the sending gate severed the wormhole prematurely, however, a local DHD would have compensated for the sudden loss of power and allowed the receiving gate to finish the reintegration process. Removing the master control crystal from a DHD before connecting it will create an event horizon without connecting to a wormhole or forming a vortex. A stargate connected to a DHD is dominant over a stargate using the dialing computer. Dr. McKay had been studying the Stargate Program out of Area 51 for over a year and was considered by the Pentagon to be the world痴 foremost stargate expert. The NID has several bases, or safe houses, for their special operations throughout the country. The Goa置ld within Adrian Conrad is being held in a safe house in Minot, North Dakota. The Goa置ld were scouting P3X-116 for a new base.